Accueil > Formations universitaires > Stages > Offres de stages Master 2 > Archives > ... pour la spécialité "Terre solide" > Is the slow slip on Japan subduction offshore Boso accelerating ? Is the slow slip on Japan subduction offshore Boso accelerating ? Over the last few years there has been growing evidence that a significant part of slip on subduction zones is released slowly1,2 and goes undetected3. Recent GPS observations also suggest that the rate of subduction of a plate segment is not constant in time but may undergo large fluctuations over periods of months or years4,6,7, resulting in diminished or enhanced plate coupling and local stress build-up. Such “slow earthquakes” contribute to further load nearby locked asperities, which are of concern to seismic hazard assessment4,5. This research internship aims at better documenting and understanding the variability of slow slip on the Japanese subduction in Boso area. The SSEs offshore Boso are possibly the best-studied cases in the world. They have been occurring in a quasi-periodic fashion since the 1970s (at least). The 2011 SSE was likely hastened by the stress transfer from the March 11, 2011 great Tohoku earthquake8. 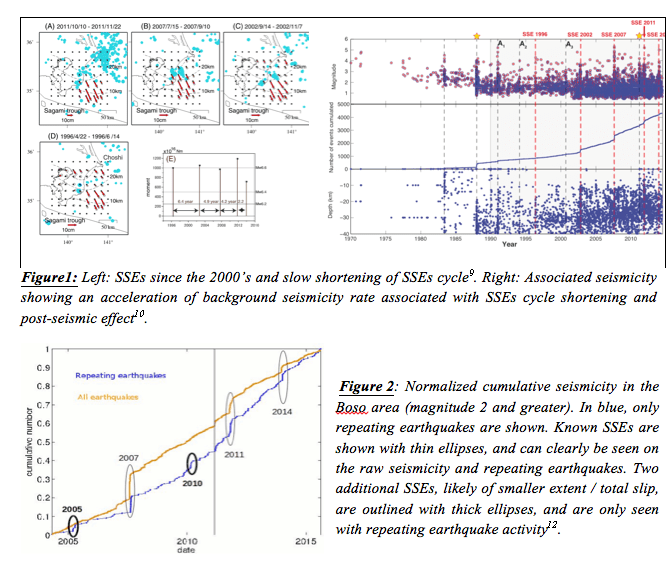 At a longer time scale, a slow shortening of their cycle is suggested to have started since the 2000s9 (Figure 1), in coincidence with a quadratic acceleration of the background seismicity in the area10 that can be traced back over nearly 25 years (Figure 2). Given the currently silent and locked plates east and west of Boso (i.e., the Philippine Sea plate could rupture along the Sagimi Trough, producing M8-class earthquakes similar to the 1703 Genroku earthquake11), these shortening of the Boso SSE cycles and earthquake activity acceleration are worrying signs of an on-going slow decoupling, and required to be better documented. In addition, analyses of m2+ repeating earthquakes in the Boso area12 show that other, smaller SSEs could have happened in 2005 and in 2010, proving that the cycle of slow slip events in Boso is probably not as simple as usually suggested by previous works. During this internship, we propose to look at the deformation signal that is likely associated with the seismological pattern described above. For that, we will need to go beyond current methods to detect and analyze SSEs. First, we will further evaluate the long-term dynamics of the zone, i.e. how and where the slip interface is currently decoupling. To do so we will we will perform a first order fit of GPS time series, in order to characterize the average interseismic loading, the main co-seismic offsets and post-seismic relaxation. We will then look for any pluri-annual velocity change, such as an acceleration of the velocity that could be generated by the acceleration of the creep rate suggested by the increased seismicity rate. Second we will characterize the variability of slow slip in order to possibly detect small slow slip events undetected so far, and understand whether slow slip occurs steadily or by a series of pulses of slip that follow each other. To do so, the residual geodetic time series will be analyzed by a Template Matching Procedure13 (which looks for synthetic deformation patterns generated by slip on the subduction interface, by cross-correlation techniques over the GPS network). Application on Mexico subduction, equipped with a relatively sparse GPS network, show that this method allowed to detect 28 small events down to a magnitude of 6 that occurred from 2005 to 201413. This part of the work will be done in collaboration with B. Rousset, post-doc in Berkeley seismological lab. A solid background in Mathematics, Physics and Computation is required for this master project. This master project aims at being continued and widened during a PhD for which a scholarship is already guaranteed by the ANR Atypic-SSE that started in October 2017. The student will therefore interact with the group of students and researchers involved in the project, in France, US and Japan. 2. Nadeau, R. M., & McEvilly, T. V. (1999). Fault slip rates at depth from recurrence intervals of repeating microearthquakes. Science, 285(5428), 718-721. 3. Métois M., C. Vigny, A. Socquet, Interseismic coupling, megathrust earthquakes and seismic swarms along the Chilean subduction zone (38°-18°S), PAGeoph, doi:10.1007/s00024-016-1280-5, 2016. 4. A. Socquet, et al. (2017). An 8-month slow slip event triggers progressive nucleation of the 2014 Chile megathrust, GRL, doi : 10.1002/2017GL073023. 5. Uchida, N., Iinuma, T., Nadeau, R. M., Bürgmann, R., & Hino, R. (2016). Periodic slow slip triggers megathrust zone earthquakes in northeastern Japan. Science, 351(6272), 488-492. 8. Hirose, H., Kimura, H., Enescu, B., & Aoi, S. (2012). Recurrent slow slip event likely hastened by the 2011 Tohoku earthquake. Proceedings of the National Academy of Sciences, 109(38), 15157-15161. 9. Ozawa (2014), Shortening of recurrence interval of Boso slow slip events in Japan, Geophys. Res. Lett., 41, 2762–2768, doi:10.1002/2014GL060072. 10. Reverso T., D. Marsan, A. Helmstetter, and B. Enescu (2016), Background seismicity in Boso Peninsula, Japan : Long-term acceleration, and relationship with slow slip events, Geophys. Res. Lett., 43, 5671 – 5679. 11. Nishimura T., T. Sagiya, and R. S. Stein (2007), Crustal block kinematics and seismic potential of the northernmost Philippine Sea plate and Izu microplate, central Japan, inferred from GPS and leveling data, J. Geophys. Res., 112, B05414. 12. Gardonio B., Marsan D., Socquet A., Bouchon M., Campillo M. A new history of Slow Slip Events in Boso Peninsula, Japan, JGR, submitted. 13. B. Rousset, et al. (2017), A geodetic matched-filter search for slow slip with application to the Mexico subduction zone, JGR, doi:10.1002/2017JB014448.